Podiatric ultrasound is one of our primarily specializations, and we would love to have the opportunity of helping you determine the best ultrasound solution for your practice — and showing you how profitable it can prove, using our systems and work flow. * Note: You may of course also simply purchase the ultrasound alone, without our complete podiatry package, at a lower price. You have the option of either buying the ultrasound alone at one price, or buying the full package at a higher price, or even of picking and choosing among what you would like to add or take away. Just give us a call and we can tailor a package precisely to your needs. See our current promotion here! The CTS-5500+ Ultrasound from SIUI, equipped with the linear 5 - 10 MHz probe (central frequency 7.5 MHz), has become our best-selling ultrasound for foot and ankle imaging. Far more flexible and far sharper than the model below it (the CTS-3300), and nearly equivalent in image quality to the more expensive model above it (the CTS-7700), the new fully-digital broadband CTS-5500+ combines exceptional imaging with affordability, making it our first recommendation in many applications, not only podiatric or musculoskeletal. 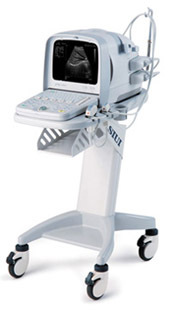 Now built upon an extremely solid UNIX software platform, the CTS-5500+ is now upgradeable, meaning that as upgrades are released (free to Fisher Biomedical clients), your ultrasound simply becomes better and better over time. And what's more, we are working directly with the manufacturer to make the next upgrade heavy on custom podiatry features we have cooked up working with all of our podiatrists. The CTS-5500+ also now boasts an excellent array of image-management functions, enabling you to not only make all of your measurements and annotations quickly and efficiently, but also allowing you to save images internally or externally (to a USB thumb drive), in a variety of file formats (including the popular .jpg format for saving your captured and annotated images, and even the .avi format for saving your entire cineloop as a video file!). rather than the new 5500+ with LCD display. What contributes most to the image quality on the CTS-5500+? How many injections per week? Would you like to add referrals? The CTS-5500 is now an integral part of my imaging regime. It's easy daily use helps me to identify many clinical problems immediately oftentimes without the need for additional costly imaging studies. Patients like to see their images and can take a picture with them to show their family. I am extremely happy with the purchase and have found that the insurance reimbursement has far, far outweighed the cost. 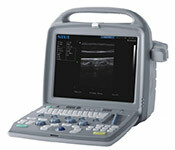 The [CTS-5500] ultrasounds have been a great addition to our practice. The reimbursment has been great so far, and it is an excellent tool to get insurance to approve MRI on those cases where prior certification is required. Ultrasound also takes a lot of guessing out of our work, for example [differentiating] a painful os tibiale externum versus a posterior tibial tendinitis. And ultrasonography is about to become the standard of care for diagnosing soft tissue masses.